Apt613 was invited deep inside a secret bunker to try out Ottawa’s newest escape room that opens today. In an effort to track down a terrorist who has a flair for explosives, my team of six is guided by a scruffy informant who tells us to keep our eyes closed. We walk blindly in single file, following his lead by holding onto one another’s shoulders. When it’s time, we are allowed to open our eyes and the perimeter of a dimly lit bunker is revealed — only to soon realize we’ve walked into a trap and must escape The Boom Room. The Boom Room is the first of four escape rooms that are planned for Escape Room Ottawa and is designed for adventure enthusiasts as they race against time to solve a variety of clues and puzzles. “Nobody has escaped yet [before the one hour time limit is up],” says Brian Seto, one of three co-founders for the business who explains that a few people have tested the room so far. Seto notes how some escape rooms are limited to only one room, emphasizing that visitors to Escape Room Ottawa can expect multiple rooms, larger rooms, and better stories. It seems that there’s more adventure entertainment in Ottawa than ever before with at least six other locations including Escape Manor, Claustrophobia, Jigsaw Escape Rooms, Key Quest, Tick Tock Escape, Ottawa Escapes– all welcome opportunities for those looking for a brief escape. 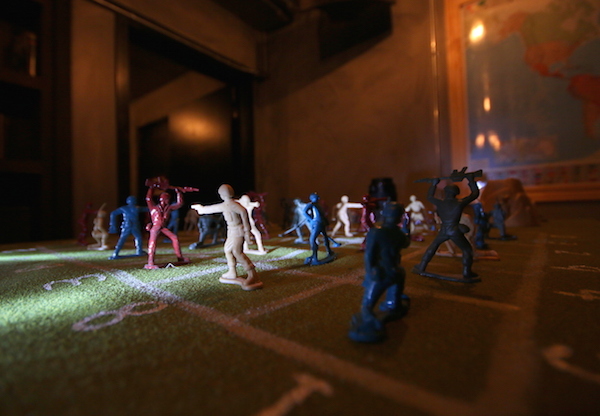 Contrary to the standard 45 minutes of game play that is normally offered by other locations in the city, players are given an hour to escape The Boom Room. You’ll likely need every minute as there are multiple, comparatively spacious rooms to explore using map and compass, as well as peeling through drawers, ammo boxes, camouflage netting and military surplus. “Some of the things I found [for the escape room] were hard to part with because they’re so rare,” says Seto, who procured most of the stuff you’ll see in the room. 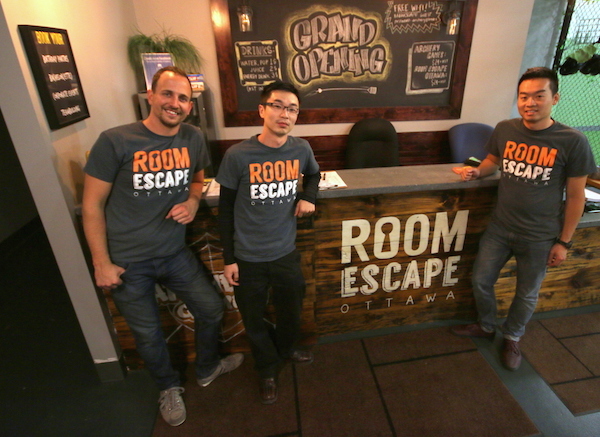 Ramsay Jackson, Qi Hu, and Brian Seto, the three co-founders of Room Escape Ottawa and Archery Games Ottawa. All photos by Kenneth Ingram. Those who have experienced other escape rooms will recognize similar puzzles found elsewhere in Ottawa; however, The Boom Room combines them with a few new ones to create a methodical yet interactive experience. Seto reveals that Serial Killer Charade will be the next room to open, likely before December, and there are plans to build a room that offers a vertical experience next. Room Escape Ottawa is collocated with Archery Games in a warehouse at 1860 Bank Street. Game play is one hour and ideal for 2 to 8 players. A 20% discount is offered this grand opening weekend. Regular price is $24 per person. For more details visit the Room Escape Ottawa website.